Selected in the second round (17th overall) of the 2017 CFL draft and signed on May 18, 2017. (Calgary) Lynch played 14 regular-season games as a backup receiver. He had two catches for 62 yards including a 40-yard reception against Toronto in Week 16. Lynch was in uniform for both post-season games and had one catch for 26 yards in the Grey Cup. 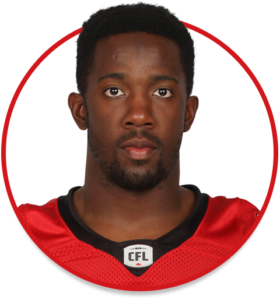 (Calgary) Lynch played seven games, making his CFL debut in Game 9, and had two catches for 18 yards and one special-teams tackle. In 28 career games over five seasons (2012-16) at the University of Saskatchewan, Lynch made 85 catches for 1,133 yards and seven touchdowns. He also had five carries for 32 yards. Over the 2015 and 2016 seasons, Lynch played 14 games and had 77 receptions for 1,061 yards and five scores. Lynch is a product of Michael A. Riffel Catholic High School in Regina. He played basketball for the Royals and started playing football in Grade 11.